Monticello Road: If the Landlord Wants it and the People Want it, What's the Problem? If the Landlord Wants it and the People Want it, What's the Problem? In the past week, two great new murals have appeared. Both have strong messages and strong Art-Historical pedigrees and both were done with the approval of the landlord. 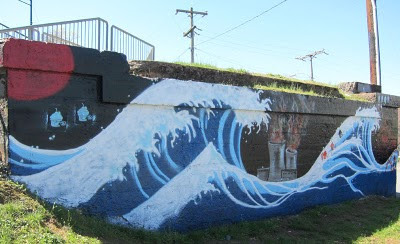 The pictured image (under Belmont Bridge) is NOT however the subject of this post. In the most recent Spotlight discussion, someone put forth a notion I'll call the Breeden Doctrine. We were talking about what it takes for a piece of renegade public art to last and she said it's quite simple: if it's good, the public will embrace it and allow it to stay. Therefore, if we want more public art, artists need to simply get their stuff out there--a leap of courage--and do good stuff. Right now in Charlottesville, we see that dynamic playing out in real time. About two weeks ago, a group of students from a local high school got together with a local bookstore/artspace to paint a huge mural on the exterior of the latter's downtown space, which is located in a fair dilapidated stretch but right in the middle of town. Literally before the paint had dried, the City's Architectural Review Board threatened to fine the store for modifying the space without a permit. The mural depicts a Native American from Edward Curtis' famous series of portraits from the turn of the last century. Aside from ruffling the quaintness cops' general aversion to any departure from the Jeffersonian style, the mural sits directly opposite the Lewis and Clark monument, complete with Sacagawea cowering behind the great white men. So the big impressive Indian Chief could seem like a thumb in the eye to some; it's certainly a response. But you know what? Everyone I've spoken to loves the mural and the creative community seems to have rallied behind it. Even members of the ARB don't seem too upset--they just want their application and fee. So I think it will stay. Some of the comments I've seen on local discussion fora worry about the precedent: would this not open the door to a monumental portrait of Hitler, for example. I think the answer is no: the public would not accept something they hate. This piece will be allowed to remain because it's right for the location--and a very fine painting. Of course there's more to it (here| here | here) but it's an interesting question and it's inspiring to see artists inserting their voice into the public sphere, being slapped for it--and defended.